SignalFx AWS Optimizer gives you actionable insight into cost-saving opportunities, underutilized investments, usage patterns, and cost attribution. You can view data by InstanceType, AWS Region, AWS availability Zone and categories specific to your setup, such as Service, Team, or any other dimensions that are sourced from EC2 instance tags. 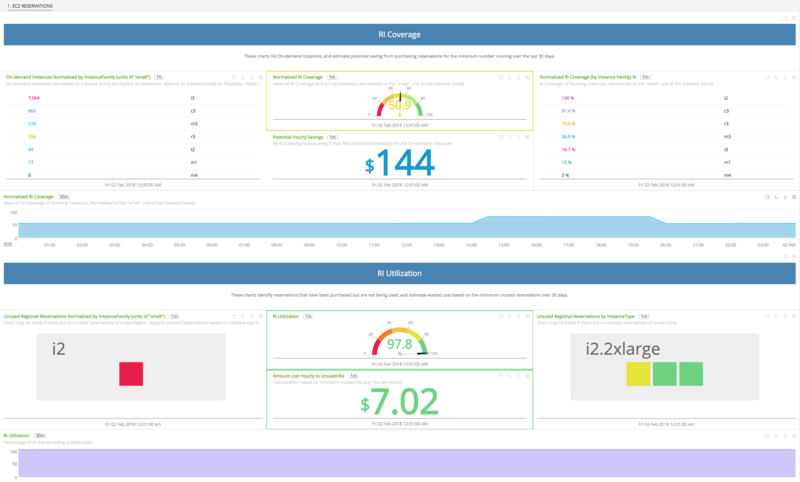 SignalFx makes calls to the AWS API to retrieve cost and usage data and derives metrics with which you can visualize EC2 usage and approximated costs. You can also create detectors based on this data, so you can get alerted in real-time on unexpected changes in cost or usage patterns. The imported data does not include AWS Billing data. Data is not imported for EC2 Spot Instances. If you have multiple AWS Accounts, they must all be included in the SignalFx AWS integration and have Import data for SignalFx AWS Optimizer selected. If this is not the case, the generated metrics will not reflect accurate values. 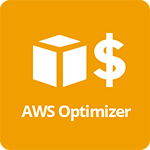 AWS Optimizer generates usage & cost metrics and makes these available for visualization, analytics and alerting. EC2 Reservations: Suggestions to optimize EC2 Reservations. EC2 Cost and Usage: Details of EC2 Cost and Usage information. 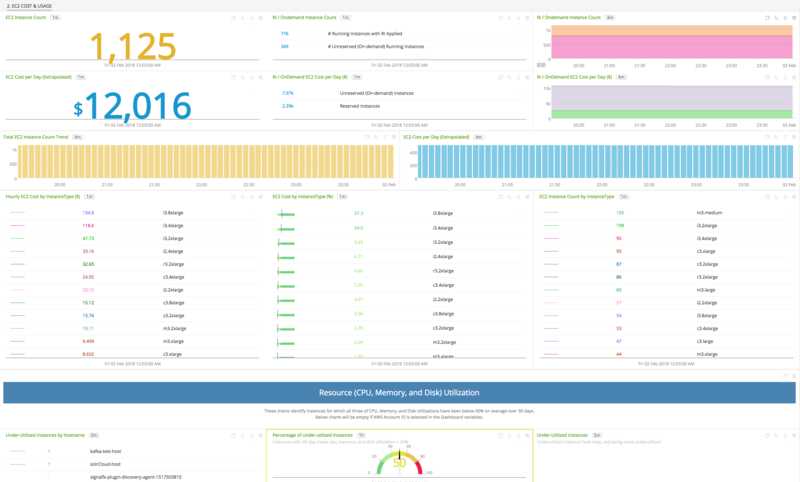 EC2 Worksheet: Charts to help dive deeper into and troubleshoot EC2 Usage. To access this integration, connect to Amazon Web Services. SignalFx provides built-in dashboards for this service. Examples are shown below. The average cost of a running EC2 instance (of a given instance type, region, platform, and tenancy). The calculation factors in Reserved Instance coverage and utilization, but does not factor in any negotiated discount. This metric reports a value of 1 for every running EC2 instance. 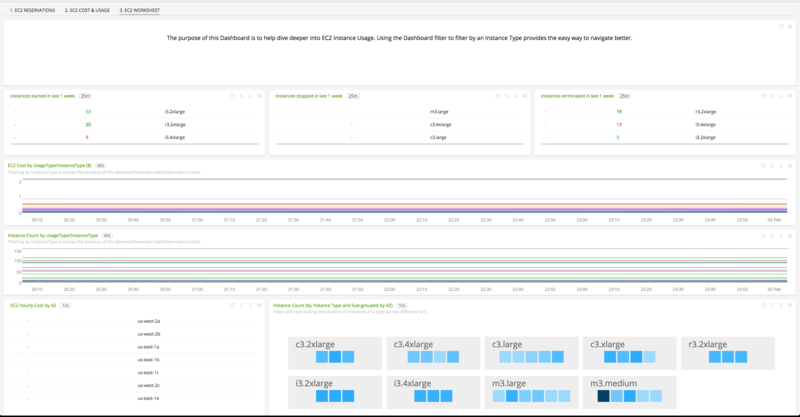 All AWS tags associated with a specific instance are available as properties on the metric time series, and can be used in analytics for filtering and grouping by custom tags. This metric reports a value equivalent to the AWS normalization factor (e.g. 2.0 for a “medium” sized instance) for every running EC2 instance. All AWS tags associated with a specific instance are available as properties on the metric time series, and can be used in analytics for filtering and grouping by custom tags. Count of state changes of EC2 instances (e.g. instances started, stopped, or terminated) in the last minute. Number of running EC2 Instances (of a given instance type, region, platform, and tenancy) for which there are no Reserved Instances available to apply. Number of running EC2 Instances (normalized to the small instance type of the instance_type dimension) for which there are no Reserved Instances available to apply. Cost of an EC2 On-Demand Instance (of a given instance type, region, platform, and tenancy) as publicly made available by AWS. Amortized average cost of an EC2 Reservation, taking into account the upfront cost and recurring costs over the entire term of the reservation. Time (in milliseconds) until an EC2 Reservation expires. Amortized average cost of a purchased EC2 Reserved Instance (of a given instance type, region, platform, and tenancy). Number of EC2 Reserved Instances available (of a given instance type, region, platform, and tenancy). Number of EC2 Reserved Instances used (of a given instance type, region, platform, and tenancy), normalized to the small instance type of the RI’s instance family. Amortized average cost of a purchased EC2 Reserved Instance, normalized to the small instance type of the RI’s instance family. Cost of an EC2 3-Year No-Upfront Convertible Reserved Instance (of a given instance type, region, platform, and tenancy) as publicly made available by AWS. This metric can be used to estimate potential savings from the On-Demand to RI Conversion.